The team at Tim’s Turbos is fanatic about providing top-notch turbocharger services that ensure your engine is performing at peak levels. Our shop only uses the most advanced techniques and top-of-the-line equipment to ensure we provide our customers with the very best finished product. Balancing is absolutely vital to turbocharger rebuilding, because it provides the stability that is critical at high speeds. We use a Heins TC3 machine and state-of-the-art VSR rebalancing techniques to ensure your turbocharger can easily handle 150,000 RPMs and higher. Our VSR balancing process exceeds OEM and performance market specs to improve longevity and faster spool up times. After we have completed shaft striating, each rotating component of the turbo is balanced separately and then re-balanced after re-assembly to ensure safety, reliability and high performance. 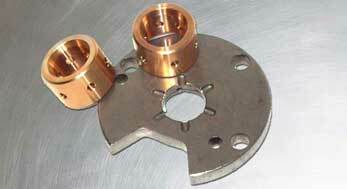 During re-balancing, our process surpasses most turbocharger rebuilding shops. The center cartridge is places in our VSR balancer, and, supplied with fresh oil, the rotor group is tested to ranges that exceed 150,000 RPMs. We test for mass imbalances of the core, harmonics, and oil leaks. If the turbocharger does not pass the test within four corrections, the turbo is disassembled for wear inspection before going through the process again. At Tim’s Turbos, we don’t believe in short cuts. When we build hybrids and high performance turbos, upgraded bearings are not an option – they are a must-have. We offer grooved bearings to better filter out oil debris and conversions from the common 270 degrees thrust bearings to 360 degrees, which will improve turbo longevity under high boost applications or high differential drive pressure ratios. Because clean turbos are vital to peak engine performance, cleaning has become one of our specialties. It doesn’t matter how well you build engines, transmissions, or turbochargers – if your parts are not cleaned properly, you are guaranteed to experience engine failure. 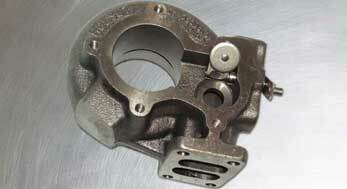 In addition to turbo cleaning, we offer manifold, intake, and turbo accessory cleaning. If we need to break out the big guns, we’ll use glass beads, aluminum oxide, and/or stainless shot. 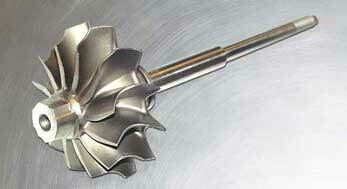 We also use a shot pen for surface harding, cleaning compressor wheels, and strengthening the backs of piston skirts. If you’d like to smooth out edges for a better oil slick, we’ll tumble turbo parts, including gears, seal plates, compressor covers, etc. We highly recommend turbine wheel clipping when you choose to upgrade to larger compressor wheels or when we rebuild small turbos in twin systems. We clip turbine wheels at three levels: 5 degrees, 10 degrees, and 15 degrees. We can clip higher, but you must specifically request it. 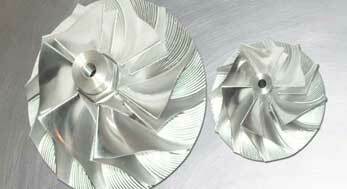 Clipping will increase the mid-range and top end power of the engine, greatly increase the exhaust flow through the turbine blades, and greatly reduce backpressure upstream of the turbocharger. As long as there’s enough material, we can bore out most wastegate ports to 34mm and replace the flapper with a 38mm stainless steel assembly with an adjustable throw arm. Top notch quality and customer service, lifetime customer here! Tim built a custom turbo catered to my specific setup and goals, VERY happy with the end result. Build quality is perfect, everything has exceeded my expectations. Also very helpful with any and all questions I had, HIGHLY recommended! Tim is great!! He took his time to open up the turbo on the spot. He showed me how it failed and why. This was the 2nd turbo from another shop. Tim figured out what was wrong with my engine and solved the on going problem. Very experienced guy, I highly recommend Tim's Turbos. I can't say enough good things about Tims turbos. I had Tim rebuild, balance, and upgrade the compressor wheel on a Garrett turbo. Everything went smooth as butter and turnaround was quick.Tim is a true master of his craft. He is extremely knowledgeable and very helpful. I don't trust anyone else to service my turbo's. Amazing guy and amazing work. I sent him a piece of trash and got a brand new Garrett cartridge back and both housings looking like new. Best secret I found in the turbo repair market! I had a terrible experience elsewhere by trying to save a bit, but I gave Tim a call and he took excellent care of my turbos. Tim is incredibly knowledgeable and I'll never go anywhere else! Excellent service I would highly recommend! Little pricier than any local spot but Tim knows his stuff and his service is TOP notch. Don't chance anywhere else! Lifetime customer. Turbo rebuilder with over a 15 years of experience. Has machine tools/CNC as well, so that housings can be accurately machined to accept different compressor wheels.Rebuilds and sells a wide variety of turbochargers from major manufacturers, along with full turbocharger rebuilding capabilities. Also has a fuel injector cleaning system along with a bunch of other specialized tools.Every time I've needed anything done, Tim has always been willing to take it on - from rebuilding turbos, to minor (and occasionally major!) welding repairs that I couldn't do myself, to helping me size a turbo for an oddball project. He's always ready to listen and is a great asset to have locally! I needed my turbo serviced asap and tim had it back to me same day! Incrediably knowledable with great customer service! Will always take my turbos to him. Tim is great to work with, very conscious with a high attention to detail. He made my rebuilt turbos perform like new! Few in the country possess his knowledge, tool set (in-house VSR balancing) and experience. THE go-to place for turbo service! Highly recommend! I felt confident that my GT30 would return home safe, and fully rebuilt. Tim and I exchanged many emails. He had no issues answering all of my questions and updating me on the whole rebuild process. I will be sending another turbo to him in the next year. Great work! Excellent service and communication! Extremely fast service over a holiday week! They know their stuff. Very helpful on choice of turbo sizing. Shipping was super fast. The turbo was well packaged. Definitely recommend this business for any looking for a turbo!!! A+++ Service, will use again for any of my turbo needs. Tim went above and beyond in re-pairing and replacing my compressor wheel on my VNT turbo. Very happy with the high quality service and lightning fast turn around time. Excellent Turbocharger! One of the best from my view point. Thank you Tim for the Flawless service and great customer service! If you need a Turbo, go to Tim! Very knowledgeable! Unfortunately he wasn’t able to help me out with my rare turbo, but gave me alternatives which ultimately lead to a better build.Highly recommend! Tim rebuilt a Mazda turbo for me a few months ago. He did a great job and the car is driving great today. I would highly recommend. Very helpful and knowledgeable. Wasn’t able to rebuild my rare turbo due to lack of replacement parts, but was very helpful in finding alternatives. Highly recommended! Tim picked me out an awesome HX35 for my setup runs beautifully Thanks Tim!!!! Tim is amazing at his craft, he took my two Garrett turbos I had in my 91 300zx and made them brand new again! The turn around for the amount of work done was impressive as well, thanks again Tim! Long story short. I bought a turbo kit for my car. The turbo was just way to big. 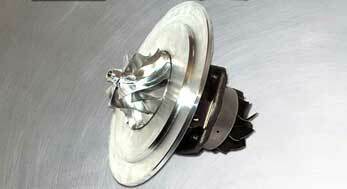 Tim’s turbos helped me pick out the perfect turbo for the car. Shipping was super fast and they packed it well. The guy definitely knows his turbo stuff. Thanks again !!! Did a great job rebuilding a pair of Holset marine turbos for me. Very helpful and excellent service all around. My engines are now much more fuel efficient and smoke far less. Turbos are much quieter and I am no longer seeing an oil sheen behind the boat. Definitely a happy customer here. Highly recommended. Absolute pleasure to deal with Tim always. Not only does he have the highest quality turbos, but I learn something new every time I speak to him. Thank you so much Tim. Tim rebuilt a T04E for my Porsche 951... highly recomended! Great turbos, great guy. My custom turbo build has exceeded all expectations and he has earned all of my turbo business as well as all.of my recommendations to anyone looking to rebuild, go custom, or needing advice. I can't say enough good things about Tim's Turbos, happy boosting! Very knowledgeable and quick turnaround. Would recommend him to anyone needing a turbo repair! Tim has been great to deal with for my crazy turbo needs. Awesome service!!! Great service and sales, the place to go for your turbo needs. Tim custom made my turbo to fit my application. I highly recommend Tim's Turbos. I just wanted to say that"m really happy with Tim's repair on my turbo. Very nice guy to work with and absolutely knows his stuff. I've learned to not trust people with my vehicles and their parts, but Tim relieved any hesitation I had once I spoke with him. I'd definitely very highly recommend him to any of my friends. Great price too, especially considering this was a manufacturer he doesn't typically deal with. Thanks again Tim, I appreciate everything! Got my IHI vf52 rebuilt by Tim, he did a fantastic job with the rebuild and took his time to explain the things that could have caused the failure to help make sure it didn't happen again. The turbo is now back on the engine along with the Forced Performance oil supply kit that Tim ordered for me, I have about 600 miles on it so far and it is performing flawlessly. Tim really knows his stuff, I highly recommend Tim's Turbos for any turbo work you need! Great customer service, answered all of my questions, and shipped the parts right away! Great customer service, fast shipping. I don't know what else to say. They have exceeded my expectations. Very good company recommend to all!!! Very experienced guys. Great place for anything turbo related. When you need an experienced team on your side that is passionate about high-quality, performance-driven turbocharger rebuilding, give us a ring.